There are some important programs such as a gaming servers, webservers, databases or mail servers that we’d need to keep running at all times but not every piece of software will have a feature of monitoring itself and re-starting whenever it is closed. It’s a similar situation if you constantly download via P2P software or download managers because you might want to keep downloading or seeding even while you’re not at the computer. It can be a source of frustration if the software crashes or hangs just after you leave it unattended because it will then have to stay that way until you come back to rectify the problem. What could be even more annoying is having other users or children closing the program down not knowing or caring that it’s supposed to stay running. This is where a third part tool comes in to help because you can setup your programs that are required to stay running to relaunch automatically if they are closed or crash. That way they will keep restarting to continue their tasks or until you stop them manually. Here’s a selection of 8 free tools that can keep an application running by automatically starting it up again when it closes or crashes. Control Running Programs is a multi functional tool to perform a number of functions on running applications. In addition to being able to monitor and relaunch closed processes, CRP can control how many instances of a program can be opened at once and also monitor the memory usage of a program, closing it down if a certain threshold is reached. An additional option can password protect the main window once it’s been minimized to the tray. After installation, click on Instance Launching in the window and click on Add (or File menu -> Add), or alternatively drop an executable onto the window (not a shortcut). Then click the button to browse for an executable or use the arrow button to select a currently running process, and supply optional command line arguments. Once you have configured the program(s) required press the button to start the monitoring engine. 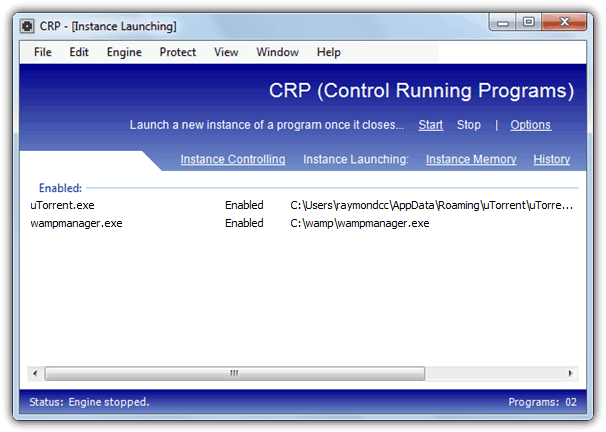 You can’t launch different programs or set a monitoring interval etc, but simply dropping a file onto the window makes CRP very easy to get working quickly. Application monitor is quite an old utility dating back to 2005, but seems to work perfectly fine on newer operating systems. It has a couple of useful options built in you don’t find in many other tools of this type, including an option to send an email when errors occur and the ability to use different checking intervals for each application you want the program to monitor. Adding a process to monitor is easy, click the Add button, give it a name and then browse to the executable file. Then add optional arguments and set the checking interval, the default is 2 minutes but it can be any where between 30 seconds and 3 hours in 30 second increments. As soon as you tick the box to activate the application profile, it will launch the process and begin monitoring. 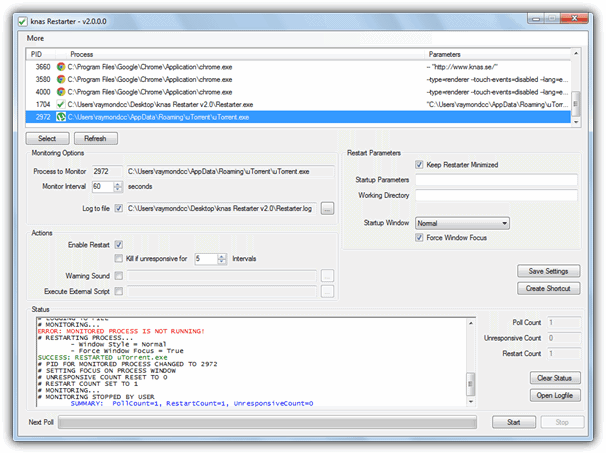 Application monitor is portable and requires .NET Framework 1.1 or higher. Restart On Crash is slightly different because it was designed primarily as a tool to restart a program after it’s crashed or hung, but is equally at home in restarting an application that has been closed accidentally or by someone else. It’s an easy program to use and configure while being portable and quite light on memory, only using around 2.5MB of system RAM during monitoring. When configuring Restart On Crash you can assume a program has crashed and needs restarting when it has actually crashed and not responding, and also simply if it isn’t running which covers when the the application was closed manually. Click the Add button to enter a new monitored application and either locate the executable or select a running process, this will enter the same executable in the command to execute. You can of course run scripts or other programs if you want. By default closed/crashed programs are checked every 60 seconds, this can be changed and the log file can be setup from the Settings window. According to its developer, Restarter was originally intended for monitoring and restarting Counter-Strike game servers, but can be used on other applications with no problem. The main interface is a bit more complicated looking than some of the other tools here, but still isn’t really that difficult to configure. Restarter has portable and setup installer versions available and requires .NET Framework v2 to function. To monitor a program it first needs to be running as Restarter selects the executable from a list of opened processes, then you can choose the monitor interval (default is 60 seconds), whether to restart the process, kill an unresponsive process, play a warning sound and run an external script (reboot and send email VBS scripts are included). Supplying a working directory and startup arguments are optional extras. Restarter has a Create shortcut button which will add a desktop shortcut to allow launching the selected application and then monitor it automatically. Program doesnt run under Windows 10, installs and shows loader screen then immediatly crashes. can only monitor DIRECT exe files, not multiple files with the same name, e.g running multiple servers with commandline parameters. Same as above, and if a EXE is restarted (tested with notepad.exe, had 2 windows opened) it will restart the EXE but still think its crashed and keep doing it. – didnt try the others as they didnt fit my purpose. I lov3 the restart on crash application. Simple and intelligent. Thanks! Restart on Crash is awesome and just saved me days of programming to keep a server application running after a crash! Thanks for this! Service Ex: The service manager with a little extra. Error! Be sure there is a file called windowshostprocess.ini in the current directory and that it contains a ServiceExeName value. The name of the service I i gave is windowshostprocess and I have provided the ini file and instructed in the ini sample file. KNAS’ Restarter will crash your server due abnormal resource usage (bad coding I guess). Application Monitor does not work on Win 10. It keeps starting multiple instances of same program over and over. Not tried other one.. I guess I cant trust those programs. I will make my own with Auto it or similiar macro software. all these work fine except when there’s a not responding ‘close program’ box open. is there any that will close this box and restart the prog? Agreed, this is a necessity as Windows almost always pops up a “Close Program” box. Application Monitor is very easy to use and work fine. I put the configured Application Monitor into windows startup. Is it possible to load Application Monitor minimized? I would like to restart network connection if it was lost – does anyone have a solution to this? Please upload ServiceEx.exe I can’t download it. The link has been updated but please note ServiceEx doesn’t run on Windows 64-bit. It’s working really well for us on some 64-bit Windows servers? Thank you for the report, our download was actually corrupt. It’s updated and fixed. how can i solve this problem ?? thank you in advance .. Anybody know which is the most stable of the bunch? I’ve noticed that things like screensavers derail the restart/keep running process of a few of these apps. I use RestartMe because it’s less sensitive, but i haven’t tried them all. What did the sadist do to the masochist? Nothing. KNAS’ Restarter suffers from a major coding bug that can result in your system becoming near non-responsive. I’ve used this software for years and only recently was able to discover that this software, after running for days, can bog down your system to the point of non-responsiveness. I recommend trying the alternatives first, and only going with Restarter if nothing else works for you. Great list. Many thanks, and great content! Thank you for this collection! I’m staying with Restart on Crash. thank you. really nice post to explain all useful tools for a specific purpose. I’ve been testing or using ServiceEx and it looks promising. I’m using Keep Running since it can’t be closed. Thanks for the links! This site has many “chips”.